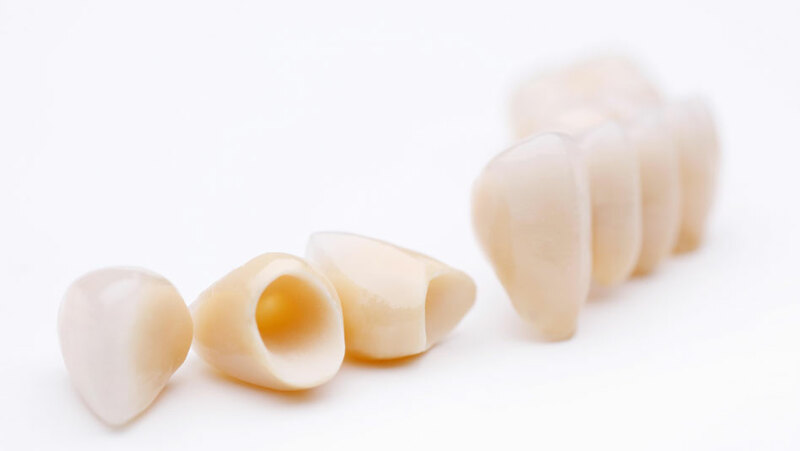 Dental crowns are artificial restorations that fit over the remaining part of a tooth, making it stronger and giving it the shape of a natural tooth. Unlike dental veneers, dental crowns completely cover teeth like a cap. Call us on 0395570957 to find out how crowns can improve your smile or schedule an appointment. The process of making a crown involves first preparing the tooth to the desired shape. An impression is taken, and from this the crown is fabricated by the laboratory. The shape, size, colour and surface characteristics of a crown are precisely matched to surrounding teeth. The crown is then fitted over the tooth and bonded in place using a bonding cement. Crowns can be made out of porcelain, metal (usually gold), or a combination of both. All porcelain crowns (empress, zirconia) are commonly used in high aesthetics area such as front teeth. Metal fused with porcelain crowns are often used for molar teeth, which are subject to significant chewing forces and require extra strength. Pure metal crowns are rare these days and are only used for back molar teeth where lack of space between opposing teeth makes use of porcelain fused to metal crowns impossible. Crowns are long-term restorations. They are, however, susceptible to the same potential problems as your natural teeth. Crowns may chip and discolour slightly over time, in the same way as your natural teeth will. In the absence of regular brushing and flossing, you may develop decay underneath a crown. Regular oral hygiene practices such as brushing twice a day & daily flossing, together with standard practice 6 monthly check ups and hygiene appointments, will help to ensure longevity of your crowns.